When all eyes are on you, you will want to look beautiful from head to toe. That is why here at Love The Bride we will make sure you will find all the perfect bridal accessories. We have a huge selection of wedding veils, wedding tiaras and wedding hair accessories that will make everyone "Love The Bride". A lot of brides have found the perfect dress but cannot find the right hair accessories to compliment that dress. We have the latest styles and the most affordable selection you will find anywhere. So whether you are looking for the latest trends, or just wanting to keep with the traditional bride look, we have what you need! 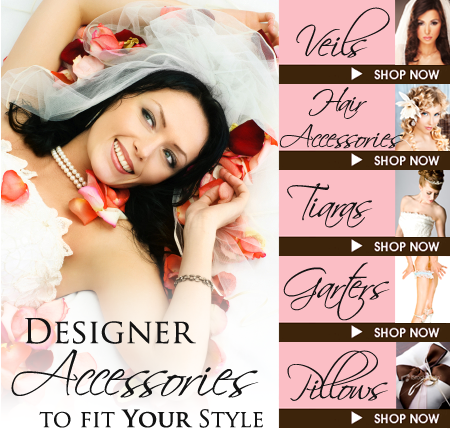 We only sell online; therefore, our products are at least 40% less than the prices you will find at any bridal store. We sell Designer products; each of our wedding veils is handmade with only the finest materials available. If you do not see a veil that you like we can custom make it for you. We offer a 100% satisfaction-guaranteed policy. We have fast, free shipping in the U.S.
Have questions? Our staff members are the experts. We are just a phone call away. We know that this is one of the most important days of your life, so it is important that you look your very best. We guarantee 100% customer satisfaction. 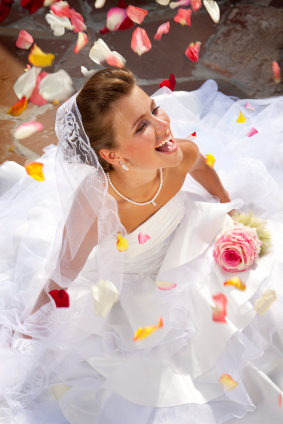 We want to make your day less stressful so you can enjoy your big day.